Severe fever with thrombocytopenia syndrome virus (SFTSV) is an emerging tick-borne virus that causes severe fever with thrombocytopenia syndrome (SFTS). Since the first report in China in 2009, SFTSV has spread over China, South Korea and Japan, with a mortality rate reaching up to 30%. To establish successful infection, 90 SFTSV must manipulate host proteins to favor its own replication. However, there lacks a comprehensive understanding of the molecular interactions occurring between SFTSV and host cells. In a joint study, to systematically identify host proteins involved in SFTSV-host interactions, the research groups led by Prof. HU Zhihong and Prof. XIAO Gengfu from Wuhan Institute of Virology of the Chinese Academy of Sciences investigated the dynamic host cellular responses to SFTSV infection by isobaric tag for relative and absolute quantification (iTRAQ)-based quantitative proteomic analysis. iTRAQ is an isobaric labeling method employed in quantitative proteomics by tandem mass spectrometry for the identification and quantitation of proteins from different sources in a single experiment. Human embryonic kidney (HEK 293) 293 cells are highly permissive to SFTSV infection and in vivo model showed that SFTSV replicated and caused pathological changes or lesions in kidney cells in mice and macaques. In addition, a wide variety of functional studies of SFTSV have been performed in this cell line, the researchers decided to choose HEK 293 cells for proteomic study. Their results provide a global map showing how host cells respond to SFTSV infection and highlight multiple biological processes being regulated by SFTSV infection. 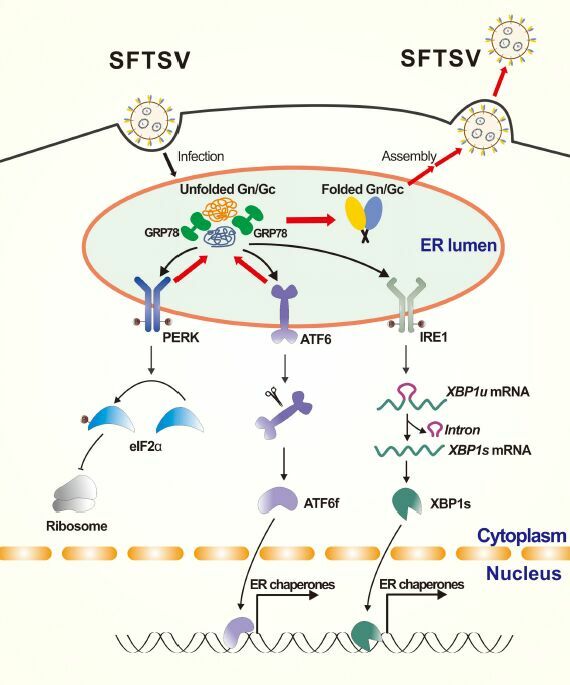 Among these, they focused on exploration of the mechanism of how SFTSV infection stimulates host cell UPR and, in turn, how the three classical pathways of UPR affect SFTSV infection. The results have been published in Journal of Virology entitled "Quantitative proteomic analysis reveals unfolded protein response involved in severe fever with thrombocytopenia syndrome virus infection". This work was supported by grants from the National Natural Science Foundation of China, the National Key R&D Program of China, and Youth Innovation Promotion Association CAS.